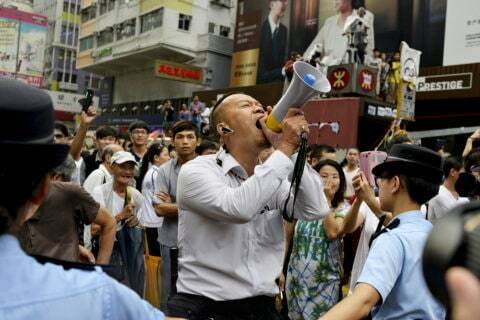 A man who opposes the pro-democracy movement makes his point via a megaphone. Antagonism between pro-democracy activists (camped out on a stretch of Nathan Road in Mongkok district, Kowloon) and a group of some local residents and pro-Beijing supporters has grown as the protests continue. The 'Occupy Central' (or 'Occupy Central with Love and Peace') movement in Hong Kong has been organising events of civil disobedience, such as sit-ins on busy roads, to protest against the Chinese government's electoral policy for Hong Kong. The activist's main demand is that elections for the post of Chief Executive, due in 2017, be open to all candidates. However, the Beijing authorities have insisted that the candidates in the election will only be drawn from a pre-approved list. Protests play an important part in the civil, political, economic, social and cultural life of all societies. Historically, protests have often inspired positive social change and improved protection of human rights, and they continue to help define and protect civic space in all parts of the world. Protests encourage the development of an engaged and informed citizenry and strengthen representative democracy by enabling direct participation in public affairs. They enable individuals and groups to express dissent and grievances, to share views and opinions, to expose flaws in governance and to publicly demand that the authorities and other powerful entities rectify problems and are accountable for their actions. This is especially important for those whose interests are otherwise poorly represented or marginalised. Yet governments around the world too often treat protests as either an inconvenience to be controlled or a threat to be extinguished. Digital technologies offer new opportunities and challenges to protests; they are now used both as a crucial medium for enabling protests to take place and as a platform for protest. Technological advancements have also significantly enhanced the ability of governments to infringe and potentially violate human rights in protests. The right to protest involves the exercise of numerous fundamental human rights, and is essential for securing all human rights. While important in all societies, few protests are completely free of risk of harm to others. Hence, international standards allow for restrictions on many of the human rights engaged in protests; however, these are allowed only under limited and narrowly defined circumstances. Despite existing guarantees in international human rights law, it has been widely recognised that states need greater guidance in understanding and implementing their obligations in this field. These Principles, therefore, elaborate a set of minimum standards for the respect, protection and fulfilment of the right to protest, while promoting a clear recognition of the limited scope of permissible restrictions. They represent a progressive interpretation of international human rights standards, including the Universal Declaration of Human Rights, the International Covenant on Civil and Political Rights (ICCPR) and the International Covenant on Economic, Social and Cultural Rights; of regional human rights standards; of accepted and evolving state practice (reflected, inter alia, in national laws and the judgments of national courts); and of the general principles of law recognised by the community of nations; in particular the UN Basic Principles on the Use of Force and Firearms by Law Enforcement Officials, the UN Code of Conduct for Law Enforcement Officials, the standards elaborated by special procedures of the UN Human Rights Council (namely the Joint Report of Special Rapporteurs on the proper management of assemblies), and the Organization for Security and Co-operation in Europe’s Guidelines on Freedom of Peaceful Assembly. These Principles also acknowledge the enduring applicability of the Siracusa Principles on the Limitation and Derogation Provisions in the International Covenant on Civil and Political Rights (adopted in May 1984 by a group of experts) and Use of Force: Guidelines for Implementation of the UN Basic Principles on the Use of Force and Firearms by Law Enforcement Officials (issued by Amnesty International in August 2015). The Principles are intended to be used by civil society organisations, activists, human rights defenders, lawyers, judges, elected representatives, public officials and other stakeholders in their efforts to strengthen the protection of the right to protest locally, regionally and globally. Read the Principles in English, French, Portuguese and Thai. Read the Background Paper on the Right to Protest.